Every summer throughout the 1930s a grand carnival was held in support of hospitals in the Huthwaite area. At about 7.40 in the evening of Saturday August 21st 1937, while attended by as many as 10,000 people, the Hospital Carnival was severely marred by a terrible accident which took place in full view of everybody. 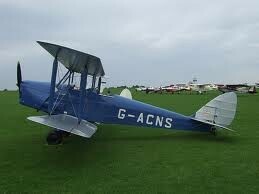 James Bradbury, a popular decorators' shop proprietor and 'competent' amateur pilot aged 35 from Sutton, had borrowed a Moth Major biplane from Tollerton Flying Club and was performing aviation stunts to entertain the crowd. He was accompanied by a young friend Roy Crossland (aged 21), another well-liked citizen of Sutton who worked in a plumber's shop. 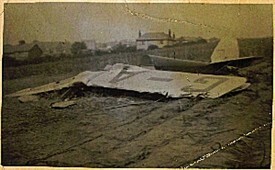 After various loops and figures-of-eight the aeroplane was seen to climb, go into a deliberate stall and spin down towards the ground - a manoeuver from which they did not recover, so it crashed into a field with fatal consequences to pilot and passenger. At the subsequent inquest, held in the basement of Huthwaite Library, District Coroner Mr H. Bradwell and the jury returned a verdict of 'accidental death'. It was agreed that there was some consolation from the fact that nobody on the ground was injured, but unfortunately James Bradbury was very much to blame for what had happened. One of the rules of the Flying Club (still based at Tollerton Airfield) was that aircraft were not to be used for stunting, though it was not uncommon in the inter-war years for people to take such regulations lightly. At about 7 o'clock on the evening of the tragedy Wilfred Whitehouse, a friend of Bradbury's, had actually rung him at Tollerton from his home in Sutton, warning that visibility was poor and that it would be foolish to fly over the Carnival. According to the Mansfield, Sutton and Kirkby Chronicle (27/08/37) 'Bradbury's reply over the telephone was "O.K. "', but evidently the good advice went unheeded. Roy Crossland's parents were on holiday in Chapel St Leonards at the time, so had to be contacted and informed. James Bradbury had no children, but was only recently married. His widow left Sutton shortly after her husband's death. Partly as a result of this particular and many similar flying accidents, the laws governing stunt flying were greatly improved and much better-enforced, so perhaps their deaths were not entirely needless. This page was added by Ralph Lloyd-Jones on 12/09/2013. I was a young boy of just 4 years (born July 1933) and remember seeing this plane looping and then crashing. We lived on Mill Lane and I feel sure we were at that location. I am well pleased to find this article and have often thought of seeing this and telling my family.